Investigators determined that a $1 increase in taxes and prices increases the probability of quitting by the last three months of pregnancy by 4.8 percentage points. A new study from Emory University's Rollins School of Public Health (RSPH) shows that higher taxes and smoke-free policies are reducing smoking among mothers-to-be. The results were published online today in advance of the July issue of the American Journal of Preventive Medicine. The researchers evaluated smoking bans and taxes on cigarettes, along with the level of tobacco control spending, and found that state tobacco control policies can be effective in curbing smoking during pregnancy, and in preventing a return to smoking within four months on average, after delivery. "We know from prior research that nearly one-fourth of all women in the United States enter pregnancy as smokers and more than half continue to smoke while they are pregnant which results in excessive healthcare costs at birth and beyond," says lead investigator Kathleen Adams, a professor in the department of health policy and management at RSPH. "This is one of the first studies of pregnant women's smoking in the new era of more restrictive state tobacco control policies, and we found a sizable increase in the quit rate. In addition, tax policies appear to be effective in keeping these women from relapsing in the first few months postpartum, and the implementation of a full workplace smoke-free policy also increases quits." Sara Markowitz, associate professor of economics at Emory University co-authored the study. Investigators determined that a $1 increase in taxes and prices increases the probability of quitting by the last three months of pregnancy by 4.8 percentage points – from 44.1 to 48.9 percent. The probability of having sustained nonsmoking four months after delivery is increased by 4.2 percentage points or from 21.3 to 25.5 percent, with a $1 increase in real taxes. A full ban on smoking at private worksites increased the probability of quitting smoking during pregnancy by 4-5 percentage points. 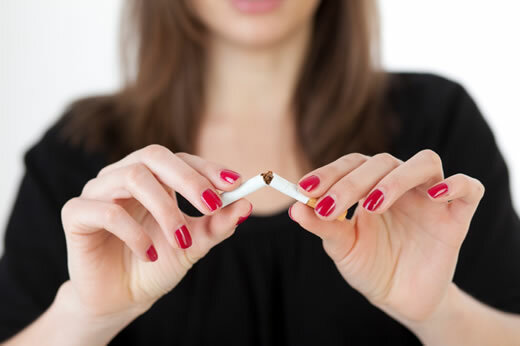 Adams and her colleagues at Emory and the Centers for Disease Control and Prevention (CDC) examined cigarette smoking among 225,445 women with live births from 2000-2005 in 29 states plus New York City. Data on smoking status (pre-pregnancy smoking; quitting during pregnancy; and remaining quit 4 months after delivery) were merged with cigarette price data, including federal, state, and local cigarette excise taxes, data on state tobacco control spending for the period, and the existence of full or partial bans of worksite or restaurant smoking. The findings did not indicate that cumulative tobacco control spending affects smoking among pregnant women. "Insignificant results on tobacco control spending may indicate that such spending needs to reach a minimum threshold as recommended by the CDC,"notes Adams. "If additional tobacco tax revenues were used by states to support implementation of smoke-free and other effective policies, then tax policy could have additional effects on prevalence of smoking and in turn, help improve birth outcomes, and reduce healthcare costs at delivery."